Just One More Ministries in partnership with New Creations Farm will be hosting a non-profit fundraiser on Sunday, October 16, 2016, from 9:00 AM until 2:00 PM. We are helping to raise funds for Food for Ghana. We will have hot dogs, snacks, and drinks available for a donation. We will also be having some raffle baskets. The Link for Food for Ghana is Real Stew. 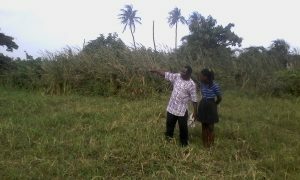 Koffi Dossa, our friend, has a vision to provide cheaper food for his village in Ghana. He needs our aid for an agricultural project that will allow him to achieve that aim, so with your help we can partner with him in providing a long term solution to the problem. We are in need of gift cards, food, and other supplies for our fundraiser. West Africa is rich in natural resources, especially land and water. Yet malnutrition and lack of potable water abound. The land has lain fallow for centuries, and the deep reservoirs of pure water just need to be tapped. The average African spends the greater part of his income on food, and in some cases, more than they earn, making it impossible to make ends meet without extra income. And needless to say, they do not have that. Many homes hardly manage just one meal per day. Food sellers exacerbate the problem rather than help alleviate it. This is understandable, as they need to make a profit too, but as middle men, their number and the profit margin determines the unaffordable price at which the food gets to the consumer. Unable to stand this sad situation on the one hand , and love for my people on the other , I have been moved to conceive the project of producing the following on a large scale to remedy the pathetic situation: corn( maize) , cassava, plantain , beans, pepper local, poultry, goat and sheep, which constitute the basic food in the sub-region where I live. With this in view, I have arranged to rent 10 acres of land to grow vegetables and grain, raise chickens and goats, and on-sell these directly to the people in the region. The land is near a water source, so irrigation will not be a problem. A spring runs through the property, I and I intend to build a small dam and install a pump. Production will continue year round. I wish to encourage the local people to grow some of their own food and grain too, so with your help I will be able to supply seed and plants at a reduced price. I need help to cover the cost of this initiative. To cover the cost of the lease of the land for 3 years (renewable), the purchase of seed and plants and the purchase of breeding stock will cost in the region of $2,500 US Funds, so I have targeted that amount. From then on, the project should be self sustainable. I am looking to my friends and any other philanthropists to help in the financing of this project, which will benefit my people greatly. With your help, I will be able to reduce the price of food and alleviate the problems of malnutrition and general health. Thank you in advance for your support for this project.